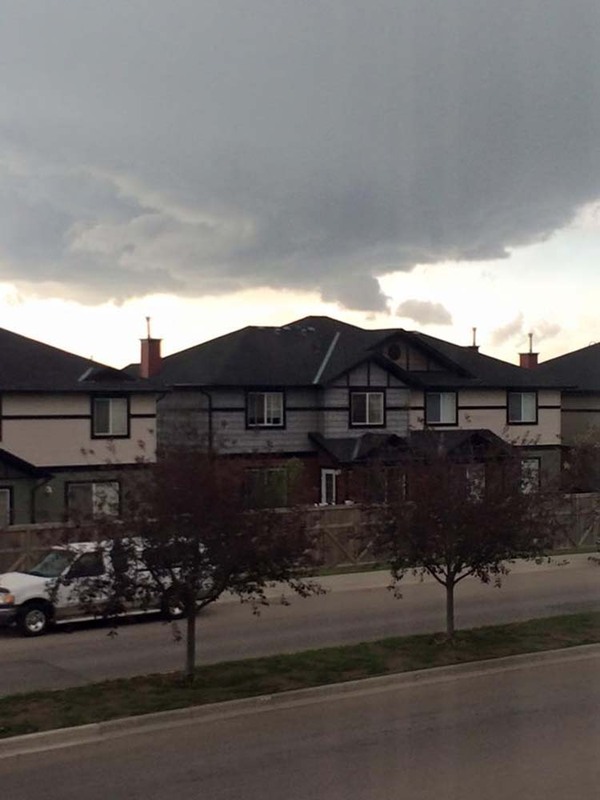 Just as many residents had finally taken a deep breath following the flooding and weather craziness a couple weeks ago, it was not what many wanted to hear when a tornado warning and then watch was issued for the City of Chestermere and other areas. On Wednesday July 22, 2015 the day started as a gorgeous sunny day – a relief from all the rain and havoc of the recent flooding. But as the day progressed, something was definitely in the air. Environment Canada issued a warning for Calgary and several other Alberta communities after a tornado was reported 10 kilometres north of Priddis (a small community about 52 kilometres south west of Chestermere) at 12:53 p.m., according to Environment Canada. There are also reports of damage on the nearby Tsuu T’ina First Nation. 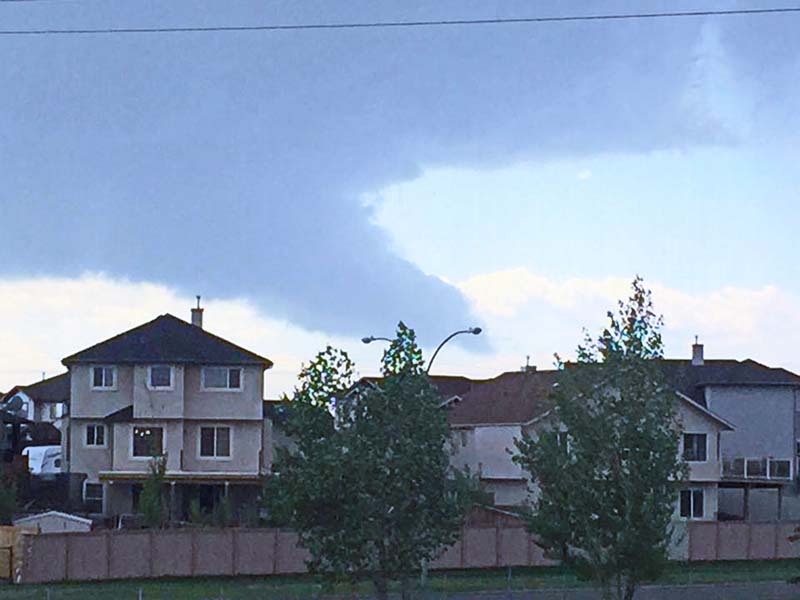 Funnel clouds could be seen around parts of Calgary and sneaking up on Chestermere. 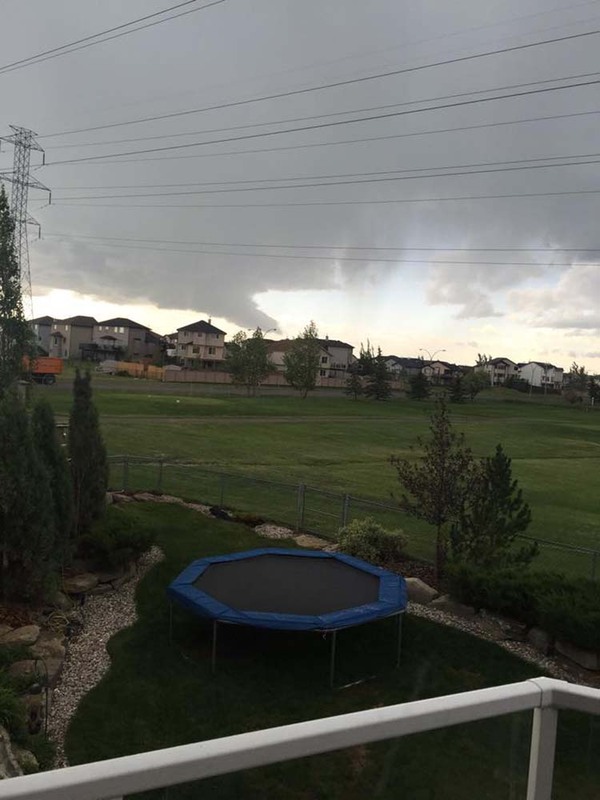 As the skies darkened, the wind began to whip and the temperature dropped more than 10 degrees in a matter of minutes, Chestermere residents eyes turned to the skies in nervous anticipation. Thankfully, aside from some wind, thunder and a brief hail storm, Chestermere was spared from the twister. They also provide some interesting facts like Canada, with the exception of the USA, is the country with the most tornados and that they usually occur during the afternoon and early evening – but have been known to strike at night too. So…..now that we’ve proven we are not tornado proof, although there has always been that rumour going around that we can’t get tornados here because we are too close to the mountains… what do you do to stay safe during a tornado? The Government of Canada has these safety tips. If you are in a house, go to the basement or take shelter in a small interior ground floor room such as a bathroom, closet or hallway. If you have no basement, protect yourself by taking shelter under a heavy table or desk. In all cases, stay away from windows, outside walls and doors. If you live on a farm, livestock hear and sense impending tornadoes. If your family or home is at risk, the livestock will be a non-issue. If your personal safety is not an issue, you may only have time to open routes of escape for your livestock. Open the gate, if you must, and then exit the area in a tangent direction away from the expected path of the twister. If you are in an office or apartment building, take shelter in an inner hallway or room, ideally in the basement or on the ground floor. Do not use the elevator. Stay away from windows. If you are in a gymnasium, church or auditorium — large buildings with wide-span roofs may collapse if a tornado hits, so if possible, find shelter in another building. If you are in one of these buildings and cannot leave, take cover under a sturdy structure such as a table or desk. Avoid cars and mobile homes. More than half of all deaths from tornadoes happen in mobile homes. Find shelter elsewhere, preferably in a building with a strong foundation. If no shelter is available, lie down in a ditch away from the car or mobile home. Beware of flooding from downpours and be prepared to move. If you are driving and you spot a tornado in the distance go to the nearest solid shelter. If the tornado is close, get out of your car and take cover in a low-lying area, such as a ditch. In all cases, get as close to the ground as possible, protect your head and watch for flying debris. Do not chase tornadoes – they are unpredictable and can change course abruptly. A tornado is deceptive. It may appear to be standing still but is, in fact, moving toward you. Environment Canada is responsible for warning the public when conditions exist that may produce tornadoes. It does this through radio, television, newspapers, its internet site, as well as through its weather phone lines. If you live in one of Canada’s high-risk areas, you should listen to your radio during severe thunderstorms. Wednesday July 22nd, 2015 had Chestermere residents watching the skies as this ominous funnel cloud approached the city. Looking SW over Merganser from the community of Lakeside Greens, it had all the makings of a very dangerous storm.